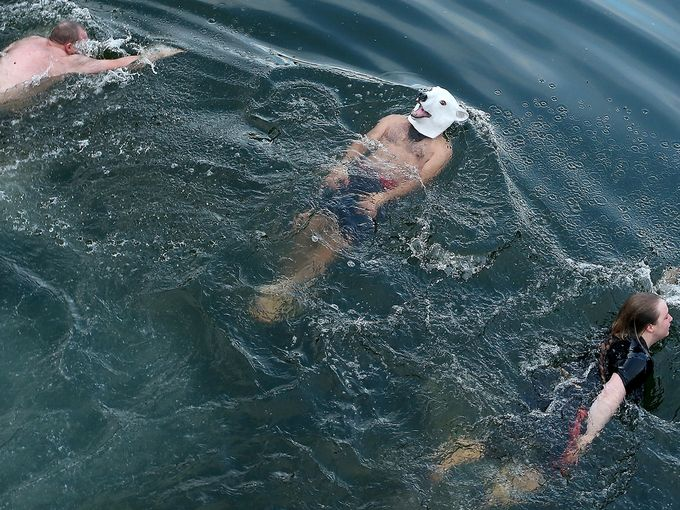 The Polar Bear Plunge in Olalla is an age-old tradition of jumping into the cold waters of Puget Sound on New Year’s Day. Olalla in South Kitsap is just one of many places throughout the region and across the globe where swimmers dare to reinvigorate themselves by washing away the year 2016 and welcoming a new year. Colin Eisenhut wears a polar bear mask while taking the Polar Bear Plunge in Olalla yesterday. Swimmers — including Colin Eisenhut, who jumped from the Olalla bridge wearing a polar bear mask — were cold enough and quite amusing yesterday, but I was able to locate some videos that might just make you shiver to watch them. For the Olalla event, photographer Meegan Reid posted 35 very nice photos on the Kitsap Sun website. I wasn’t aware that snow swimming was such a sport until my wife Sue pointed me toward an amusing video that showed up on her Facebook page. After searching the term “snow swimming,” I sorted through dozens of videos to come up with a few I hope you enjoy.